Many thanks to UPA Gallery – and Pierre Dutertre in particular – for inviting back me to write this follow-up blog on neutral density filters. I’m grateful for the opportunity to share my image capture workflow with readers of this educational blog series. In my last UPA blog post ( http://www.upagallery.com/blog/2014/7/2/the-use-of-natural-low-light-and-neutral-density-filters ) I reviewed how I use neutral density (ND) filters with prime lenses to create water-blur effects in my concept-based, Florida landscape series. 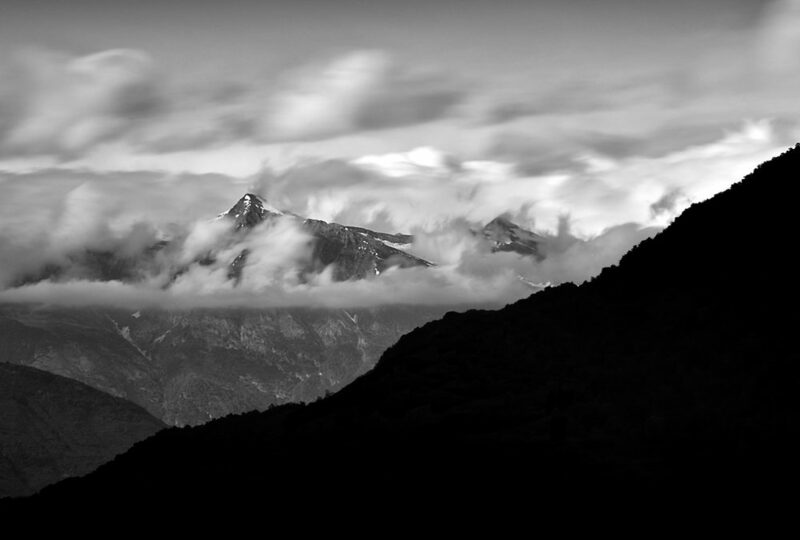 In this post I’ll review my “Dark Mountains” project and how I use ND filters with zoom lenses to achieve cloud-blur effects. Let me begin by first emphasizing that I prefer using prime lenses for landscape photography. Their sharp clarity, reduced barrel distortion (compared to a zoom lens) and ease of use with ND filters make them ideal for when I can get up close to my subject. But this isn’t always possible – or even advisable – in some cases. Another “issue” with prime lenses: when I’m traveling overseas, the last thing I want to do is haul around a bag full of different lenses! So, as a practical matter, a good zoom lens with a decent focal range (including wide angle) offers versatility for a variety of settings. The main zoom lens I carry is a Nikkor 28-300/1:3.5-5.6 VR. It’s a great lens with a great focal range – especially for travel photography! However, using ND filters with a zoom lens can be a little trickier than with a prime lens. I’ll review this in more detail shortly. First, a quick review: what’s an ND filter? Basically, an ND filter is a lens made of dark glass (like sunglasses) that reduces the amount of light reaching a camera’s sensor. This allows for much slower shutter speeds in order to create motion-blur effects. There are different kinds of ND filters – slot-in, screw-in and variable – each with different density ratings that give various f-stop reductions. There are pros and cons to using each type that’s beyond the scope of this blog post, but a quick Google search using the terms “ND Filter” will pull up many useful articles for further reading. 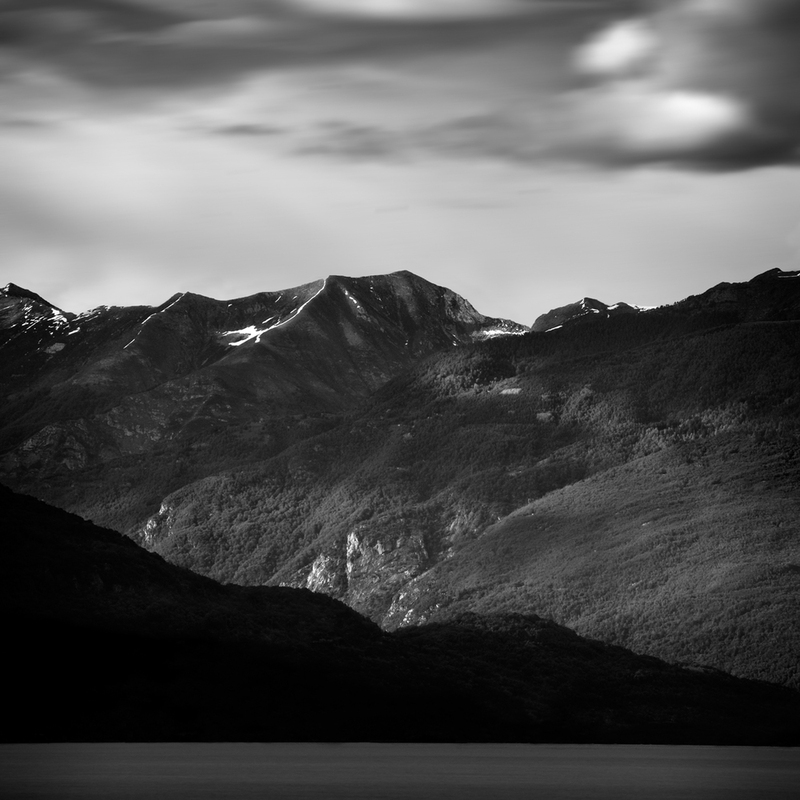 “Dark Mountains” is a project that began in the rugged and majestic Italian lakes region. The looming proximity of so many ancient mountains so close to the populated lakes offered a blunt perspective on the human footprint: how inconsequential we seem compared to these hulking, geologic shapes. Although these mountains have been the familiar backdrop for thousands of years of local human history, their age, jagged mass and atmospheric volatility also gave them an air of danger and mystery. Here, one is made freshly aware of just how small, transient and vulnerable creatures we are in a much bigger, timeless physical universe. These images invite the viewer to reflect upon the enduring, elemental, often intimidating beauty of this alpine landscape. Unlike the warm, welcoming, spiritualized portrayal of mountains by Ansel Adams and others, these mountains are cold, shadowy and darkly sublime. 1. A sense of time passing by (conveyed by the moving, sometimes turbulent clouds). 2. A sense of timelessness (conveyed by the enduring geologic shapes). 3. 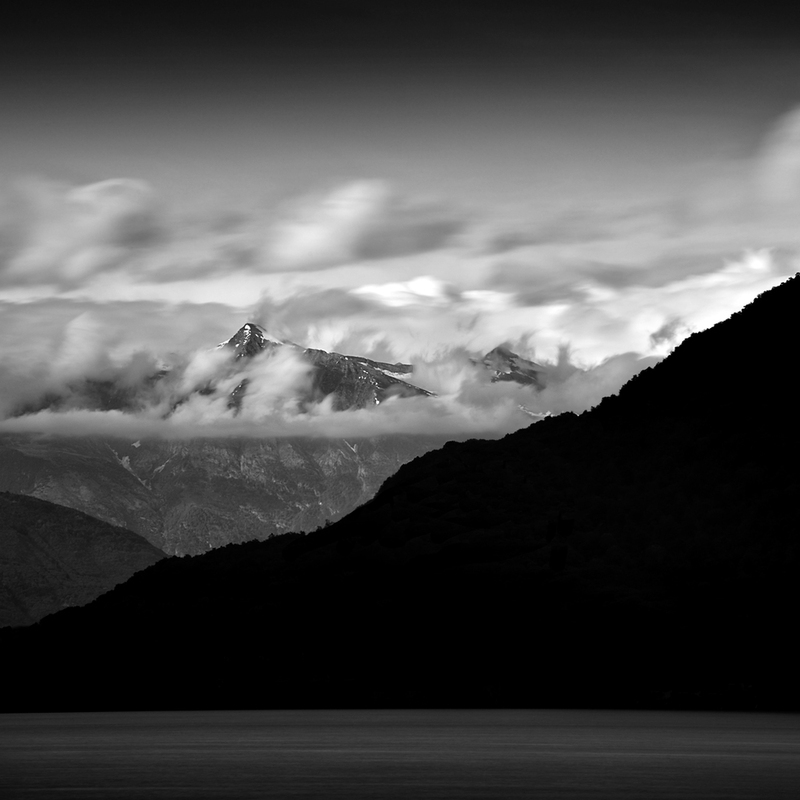 A sense of the intimidating “otherness” of the alpine environment (conveyed, in part, by the extensive use of dark tones and large areas of pure black – a Bill Brandt influence). The human presence is intentionally obscured in order to emphasize the elemental physical beauty of this landscape in a contemplative, rather than idealized, way without any distracting details. 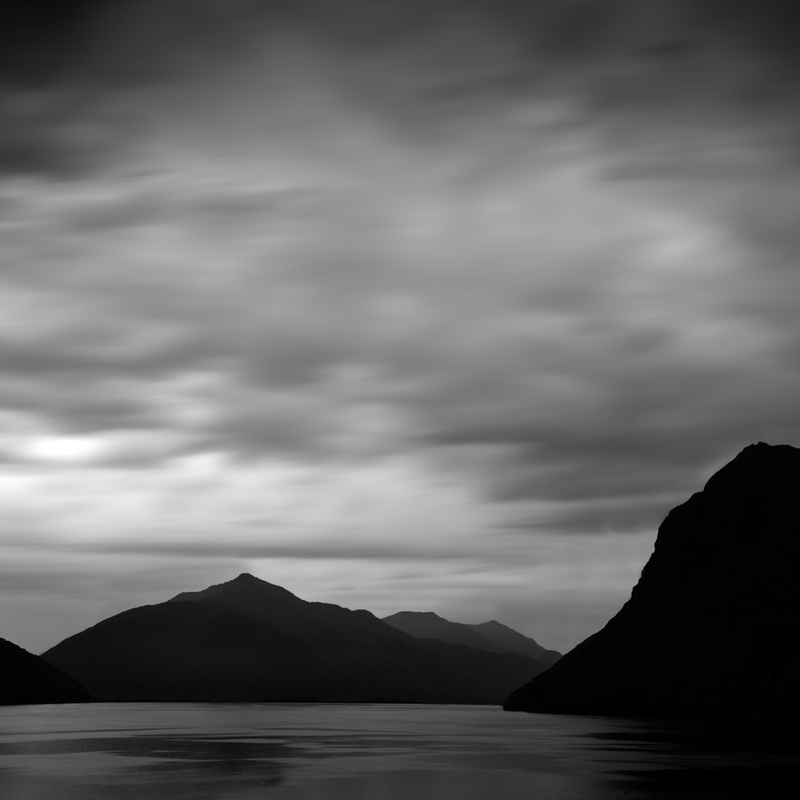 The image “Dark Mountains 4” was shot in Connobio, Italy on the shores of Lake Maggiori just after sunset. On this particular evening, the clouds looked promising with their slow, dramatic swirl around the peaks of the Swiss alps in the distance. I wanted to capture the atmospheric turbulence, so the exposure needed to be long enough to somewhat maintain the cloud shapes AND convey a sense of motion – but not too long to transform the sky into a smooth, serene surface blur (i.e. Michael Kenna). 1. Set the camera (a Nikon D600) on a tripod. 2. Use Aperture Priority (AP) Mode and Auto-Focus (AF) to compose and focus the scene. 3. I set the AP to f/18, with a focal length of 100mm and ISO 100 for a reasonably good depth of field and long enough exposure anticipating the use of a 1000x ND filter (for a 10-stop reduction). 4. Now check the shutter speed. It was 1/50 for this particular camera setting. 5. Enter the 1/50 shutter speed value into a long exposure calculator (free apps are available on iTunes!) to see what new shutter speed would be required for a similar exposure if a 1000x ND filter were attached. In this case the calculated shutter speed would have to be 25 seconds, which seemed about right for the kind of cloud-blur effect I was after. 6. Next, put the camera setting on full manual and replicate all the previous settings from the AP mode (f/18, ISO 100, etc…) and select a new shutter speed of 25 seconds (to account for the 1000x ND filter). 7. Change Auto-Focus to Manual Focus. 8. Gently attach the 1000x ND filter to the zoom lens AND be extremely careful not to alter the focal length! This is crucial: if the focal length changes even a few millimeters the original focus will be lost and you’ll have to begin the process all over again. 9. Use a wireless shutter release or the camera’s timer to take the picture. I often have to increase or decrease the calculated shutter speed based on what the first captured image actually looks like on the camera’s LCD screen. The image may be under or over-exposed (I only shoot RAW files so I can tweak the exposure in post-production). 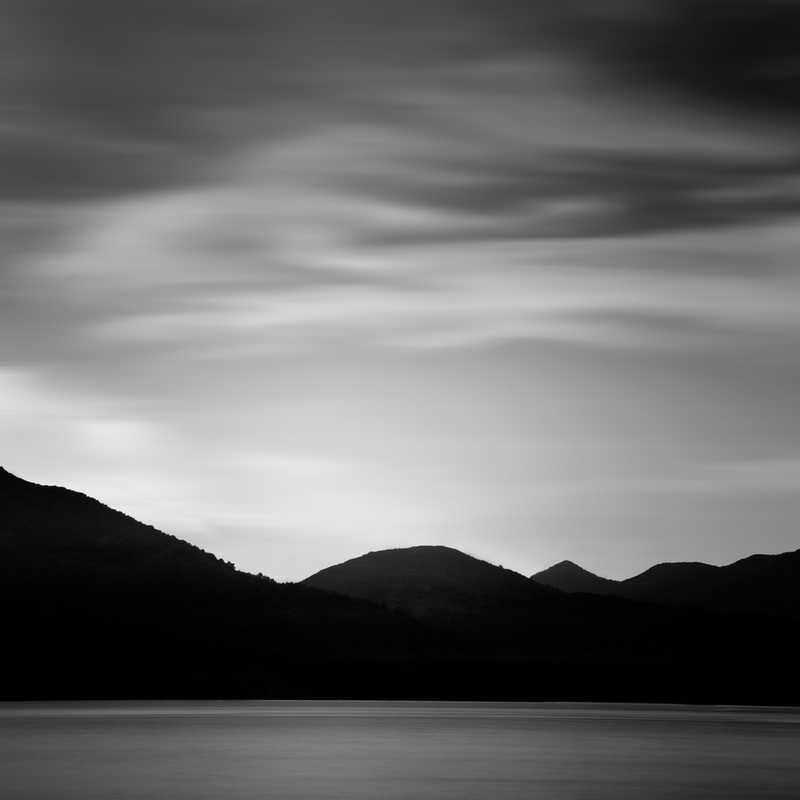 If you decide to re-compose the image, remove the ND filter and start the process all over again.